Military spokesperson Major General Asif Ghafoor has rejected Indian claims that Pakistan used US-made F-16 jets to down two Indian aircraft in a dogfight late February, telling Russian news agency Sputnik that JF-17 Thunder combat aircraft developed jointly with China were used instead. “The aircraft which engaged those targets and fought them were JF-17. As regard to how to use F-16, in what context they were used or not – because at that point of time our entire air force was airborne – now it remains between Pakistan and the US to see how the MoUs regarding the use of F-16 have been adhered to or otherwise,” the Inter-Services Public Relations director general said in an interview. 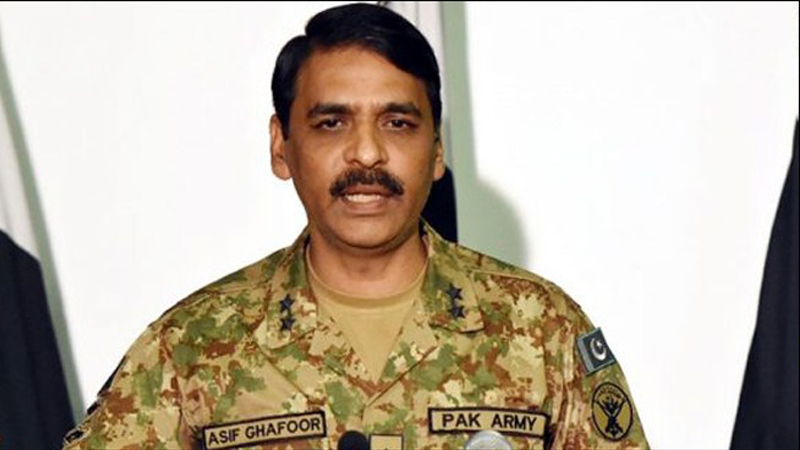 Asserting that Pakistan will use whatever it deems necessary for ‘legitimate self-defense’, Major General Ghafoor said Pakistan decided to respond to India’s February 26 incursion but chose not to threaten civilian lives. Sharing Pakistan’s account of the events that preceded the dogfight on February 28, he said Indian jets violated Pakistani airspace on February 26, dropping payloads without inflicting any casualties or damage to the infrastructure. “Next day, our air force, while staying within our own airspace, took four targets in India-held Kashmir. Being a responsible country, we could have caused damage even to the military installations or human life … but we had to show our will, capability and resolve. So what we did – we first chose the targets, and when the targets were locked by the aircraft, we shifted the point of impact to a safety distance where there was no infrastructure or human life, meaning thereby that we wanted to tell Indians that we had the capability to hit that military target, but in the interest of peace in the region we are only showing you our capability,” he said, adding that Pakistan has the footage of this operation. The head of the military’s media wing also categorically ruled out the possibility of Pakistan using its nuclear weapons, saying Islamabad sees them as more of a deterrence tool to prevent actual wars. “Since we have gone overtly nuclear, as India also in 1998, our stance is that this capability eliminates the possibility of conventional war between the two states. So that is to say, this is a weapon of deterrence and a political choice. No sane country having this capability would talk about using it,” Maj Gen Ghafoor said. He asserted that even though the protection of the country is of the utmost importance, it would be ‘insane’ to discuss the use of nuclear weapons. Pakistan is willing to take steps towards non-proliferation of nuclear arms but only if India does the same, Maj Gen Ghafoor said. “Pakistan will undertake anything which is based on equality. You cannot tie the hands of Pakistan and keep India open. Anything that happens should happen for both countries,” he stressed. Maj Gen Ghafoor said Pakistan is negotiating defence industry cooperation with Russia in the areas of aviation, air defense systems and anti-tank missiles. “We are having the aviation, we are having the air defense, we are having the anti-tank domain, which we are negotiating. And that will be positive negotiations,” he said, and noted that Pakistan will welcome Russia’s role in mediating the recently inflamed tensions between Pakistan and India. “We will welcome any third-party mediation, which can bring peace in the region. And Russia is more than welcome,” he said. The ISPR chief said Pakistan values Russia’s role in the Afghan settlement process and recognises Moscow’s importance in regional processes. “We greatly value the relevance and importance of Russia in the region, especially what role Russia has lately played toward the Afghan reconciliation,” he said. “Russia looks toward balance of power and multi-polarity in the world. We value Russia’s voice as the voice of reason, and we will love if Russia, being a powerful country, plays its role which enables bringing peace in South Asia and beyond. And we expect that Russia will do it, as the efforts in fact being undertaken by Russia are generating good results,” he added.